The Lost Boys was one of the most memorable horror films of the 80's let alone what is considered by many a top five vampire film. It can be described as very similar to a "Twilight" film of the day considering the cast pretty much consisted of every popular young male actor of the time for the purpose of selling the film to young women. It just so happens that the film is macho enough that it's enjoyable to both sexes since in the 80's horror films had to be violent and scary IE if it didn't get a "R" rating, it wasn't really a horror film. The premise of the original film is a family moves to a California town from Arizona and the young boys of the family have a run in with some delinquents of the town. The delinquents of course end up being a gang of vampires and the boys end up in a supernatural fight for their lives as the older one(Micheal) is being converted to a vampire in order to join the group while the younger (Sam) is attempting to prevent it. Why would someone want to become a vampire and hang out with a bunch of guys for all eternity you might ask? Simple...He was trying to get some. 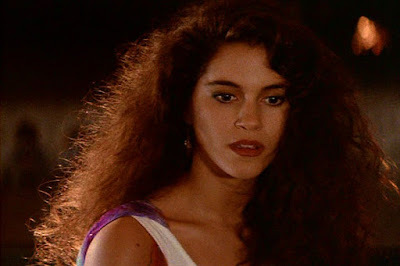 You see the head of the delinquent crew had a hot girlfriend named Star (Jami Gertz). Star is pretty much bait to bring guys into the fold. Here's the drawback though. Star is only a half vampire (she has to drink human blood to fully convert which she refuses to do) and she NEVER fangs out during the film. Had it happened she'd probably be one of the hottest vampires of all time but she'll forever go down as one of those "if only" situations as by the films end she's fully human again. She much like Micheal from the original film is recruited in a similar manner and much like Micheal has some issues holding herself back during her transformation where she has a handful of close calls where her brother Chris prevents her from snacking on some random guys she seduces which would have transformed her into a full vampire had she succeeded. Nicole isn't the only female vampire of this film. This films version of Star comes in the form of a bikini clad babe named Lisa (Moneca Delain who also fangs out in the films Blood Angels as a half vampire and Trick r' Treat as a werewolf). Unlike Star she's not very wholesome. She is a vampire in all sense of the word, only exists in the film for some quick T & A (which is pretty much her role in everything she's in) and meets her demise just as quickly as she's introduced which is the only time you see her fangs. Finally two years later we get the final installment of the series 2010's Lost Boys: The Thirst. In this film Edgar Frog (Corey Feldman who is the only person to appear in all 3 films) is hired by a woman to save her brother from a vampire DJ who is planning on turning people via using vampire blood as social drugs during raves. Eventually we find out that wasn't the case at all and that he was being used just to get another vampire out of the way by a vampire but this film was basically no more than a nostalgia film. but with the 2010 death of Corey Haim the film got a completely new story which comes off as a reunion of the original casts surviving vampire hunting characters going on one last adventure complete with mid movie tribute to the characters played by actors who had passed away (who's characters were all explained to have passed away as well complete with graves). Anyway this, much like the first film had a female character that teases the audience as a potential vampire turn (Gwen played by Tanit Phoenix) but it never happens. Only one female vampire gets any real screen time and her character is more or less just a vampire henchman and that's "Lily" Played by Tanya Van Graan. As it goes you watch the first movie for the scare factor, the second film for the female vampire T&A and the third film for closure. Since they can easily be purchased together it's well worth it.